I’ve just been filled with inspiration for parks again after reading the Welsh poet and wordsmith Dylan Thomas. I’ll share his wonderful words and childhood memories in a minute. First, what’s the difference between playing inside or outside the fenced-off play area? Twelve years ago when my children were really little, I spent hours at a time in local parks big and small. Sometimes, by 9am, I’d be down there, running around, dodging broken glass, pushing them on the lone swings or assisting them on the one small, orange climbing frame and slide. I quickly realised how important these public green spaces are to families of young children, crammed as we often are into houses with barely any gardens (nothing a child could run in!) and with streets that can be full of danger to a small, free child. I began to get involved with local people who wanted to improve green spaces in our area, and together we set up a park improvement group for the biggest one: a big, tree-lined field (mainly pitches) with run-down play area, municipal looking flower beds and some raggedy wild bits around the edge. We did loads, starting with raising funds for more play equipment to supplement the orange stuff in the fenced-off area. Yet almost at the same time, I realised that this place was fulfilling only a limited function for my children. They learnt new physical skills there, were active, had great fun, and always ran excitedly towards it, in this or any other park; but it cut them off from the rest of the green space in the park, and it was the times they played outside the play area that they really seemed to expand and almost ‘be’ at a different level, as I remembered playing when I was little. So we did it more. My son used to bring little figures with him and camp out in the rockery area, staging crashing cliff-top battles and rocky adventures, totally absorbed. And both he and my daughter loved to play hide and seek in the alley of small trees, finding dens and secret worlds. So much so, in fact, that I began to seek out the parks that had more wild bits: the overgrown grave yards or the war memorial with bushes and benches. And on the best days we met up with friends for whole mornings, whole days even, and gangs of children played out who knows what adventures, stories, make-believe and magic in these seemingly unremarkable patches of land while we talked. As any of us knows who has watched children play like this, for that brief time they’re not ‘playing’ it as we understand the word, they’re living it. It’s a deeper, richer, more alive and learning-full experience. As my children got older and started school, I realised that the mental equivalent of the fenced-off play area also existed there. School exercised and stretched their minds and their social skills and taught them to read and write and lots more. That’s huge. But somehow, beyond the structures of curriculum and Learning Objectives, there was another, wider, deeper more free learning that they could have; more creative, curious, rich and personal. All of this is why I’m involved with Room 13 Hareclive and Playing Out in Bristol, and why I wrote my book. Because whilst these fenced-off areas in parks and life were created to help children, they’ve ended up limiting them and boxing them in, and we need reminding of what children can do and be outside them. “And the park itself was a world within the world of the sea town. Quite near where I lived, so near that on summer evenings I could listen in my bed to the voices of older children playing ball on the sloping paper-littered bank, the park was full of terrors and treasures. Though it was only a little park, it held within its borders of old tall trees, notched with our names and shabby from our climbing, as many secret places, caverns and forests, prairies and deserts, as a country somewhere at the end of the sea. And though we would explore it one day, armed and desperate, from end to end, from the robbers’ den to the pirates’ cabin, the highwayman’s inn to the cattle ranch, or the hidden room in the undergrowth, where we held beetle races, and lit the wood fires and roasted potatoes and talked about Africa and the makes of motor-cars, yet still the next day it remained as unexplored as the Poles – a country just born and always changing..”. A country just born and always changing… It’s good to remember that parks can still be that for children. This entry was posted in Childhood, Education, natural play, Play by Ingrid. Bookmark the permalink. Many thanks for rediscovering another literate evocation of play. With such advocates how can it still be so misunderstood by so many! I have just read your book and loved it, and am passing it on to friends and colleagues. 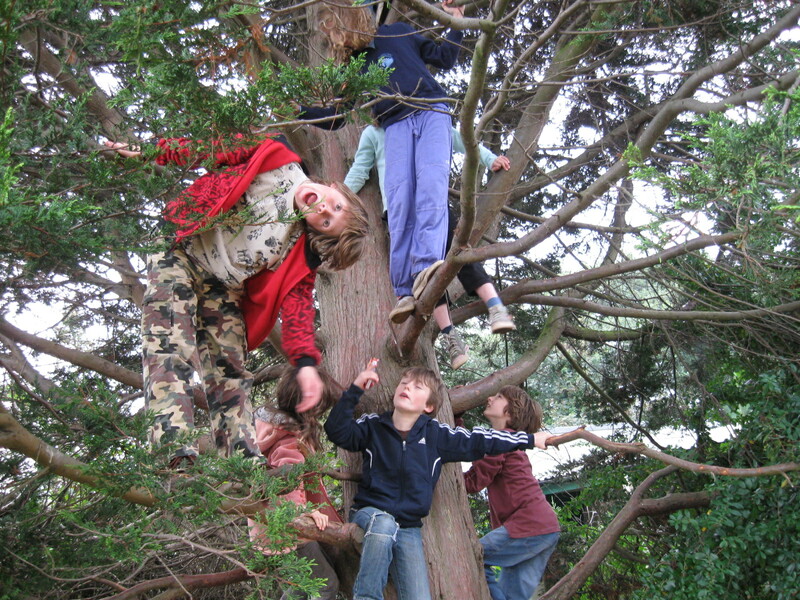 I run a forest school (which is as wild as we can make it) and thoroughly agree with what you write in your blog. Keep writing! I’m glad you liked the Dylan Thomas excerpt. I realised he was born 100 years ago this year, but what he writes about children and play is so relevant and important. I’m also so pleased you liked my book and I appreciate your encouragement! In fact, would you mind if I emailed you a question about the Forest School movement? My children just missed being involved but I hear so much good about it. My email is ingridskeels@gmail.com if so. Thank you again.